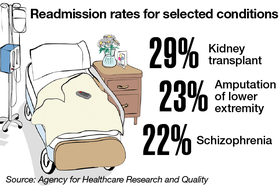 Although strides have been made to curb readmissions, the problem still plagues the healthcare system. Medicare, under the Hospital Readmission Reduction Program, has been penalizing hospitals for excess readmission rates since fiscal 2013. Year to year, the average penalty per hospital has varied, lending to the variation in total penalties. Penalties will hit $528 million in 2017, roughly $108 million more than in 2016. According to the Kaiser Family Foundation, most of that increase can be attributed to more conditions being measured. Download pdf.